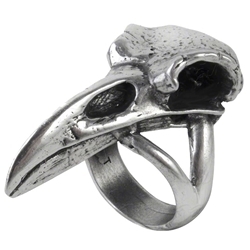 German for Ravens Skull, this Rabeschadel Ring features a sculpted pewter raven skull design set on a split ring shank. Ravens are famous in myth for their prophetic powers, acting as the messengers of Odin and capable of telling the future. The narrow beak tip extends toward your knuckle when worn, showing off its realistic form. The raven skull ring is crafted from fine English pewter that has been given an antique finish and then hand polished for a bright gleam when it is on your finger. Pair this gothic ring with Rabeschadel Bracelet (17-A105) or the Rabeschadel Buckle (17-B100) for other matching raven accessories for your look!